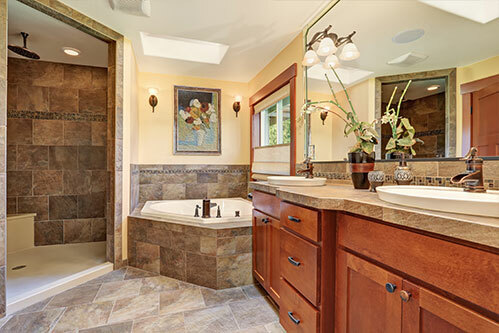 This bathroom uses the left shower and tub as its primary focus. The dramatic look and feel by using a lighter tile and accented with white walls, provides a sense of openness and uniqueness. Notice the copper “Daisy” style shower head which matches the unique sink and tub faucets. One other important feature was to use a square finish on the granite counter top to match with the other angles in the room.